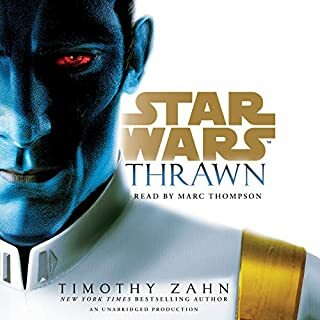 A good back story to the Thrawn trilogy! On the planet Tython, the ancient Je’daii order was founded. And at the feet of its wise Masters, Lanoree Brock learned the mysteries and methods of the Force - and found her calling as one of its most powerful disciples. But as strongly as the Force flowed within Lanoree and her parents, it remained absent in her brother, who grew to despise and shun the Je’daii, and whose training in its ancient ways ended in tragedy. Now, from her solitary life as a Ranger keeping order across the galaxy, Lanoree has been summoned by the Je’daii Council on a matter of utmost urgency. The leader of a fanatical cult, obsessed with traveling beyond the reaches of known space, is bent on opening a cosmic gateway using dreaded dark matter as the key - risking a cataclysmic reaction that will consume the entire star system. But more shocking to Lanoree than even the prospect of total galactic annihilation, is the decision of her Je’daii Masters to task her with the mission of preventing it. Until a staggering revelation makes clear why she was chosen: The brilliant, dangerous madman she must track down and stop at any cost is the brother whose death she has long grieved - and whose life she must now fear. it was a good story but the narrator could have been more diverse in their performance. The order of these books to be listened to could be more defined, it would make it easier to follow. an amazing performance failed only by the ending. 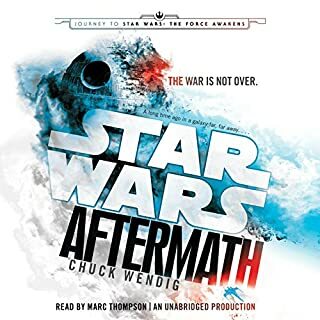 The story helped create an image of the culture of what was to split and become the Jedi and Sith, but the ending failed to actually tell us anything about how they eventually left the Tython system and mingled with the Galaxy at large. I found myself sympathizing more with Dal than Lannery, largely thanks to most the way through having the notion (incorrectly) that he would succeed in his mission and it wouldn't be cataclysmic as predicted, and it would be this that frees their people into the Galaxy, and the fear driven arrogance of the Je'daii would be proven wrong and this would lead to the evolution into Jedi and Sith. so I was disappointed when nothing came of Dal's great mission and we never even get to learn about either his machine or the hypergate.... really undercut the story build up. Would you try another book from Tim Lebbon and/or January LaVoy? What was most disappointing about Tim Lebbon’s story? The story was pretty bland and ultimately lifeless. If this hadn't been a Star Wars novel nobody would have published it. The main character was annoying, the villain one dimensional and pretty much everyone else in the story was a stock villain or bit player. I also found the use of the Star Wars themes in an attempt to create tension that simply doesn't exist was pretty sad. What three words best describe January LaVoy’s performance? What character would you cut from Into the Void? The real question is "what character would I keep?" If you are the kind of person who puts "jedi" as your religion on official documents then this book will no doubt thrill you from the first syllable to the last implied period. Otherwise it fills your ears with harmless sound for a few hours. What, no Marc Thompson?!? 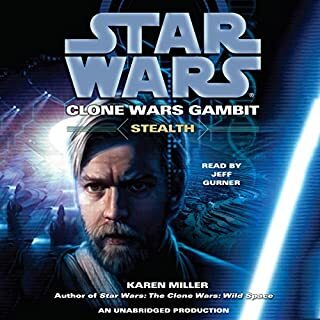 He pretty much makes or breaks any SW audiobook. He's like that familiar security blanket. And he's dang good. But so was January LaVoy. 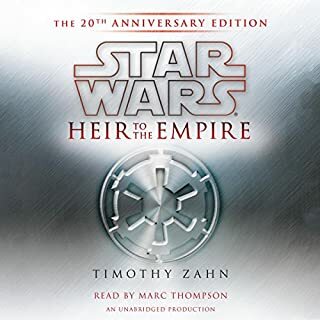 Though she's no Marc Thompson, she rises to the challenge and exceeded my expectations, and quite frankly, I enjoyed her more than other non-Marc Thompson SW narrators. Not only that, it was fitting to have a female narrator with a novel that featured a female Jed'aii front and center. Now, the story. I've been quite disappointed with the direction of SW novels as of late. 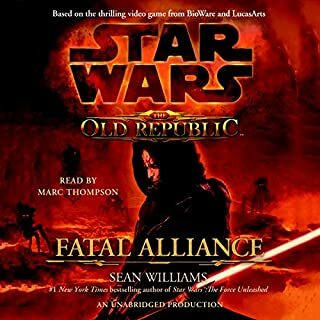 Not enough to turn me away completely, but I think the quality of the stuff coming out lately has not been as great, the overarching story arcs/time frames (The Old Republic, namely) has been lacking for me. 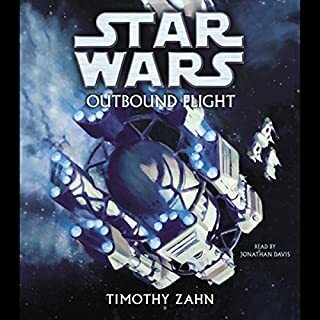 This book is poorly written, stuffed with descriptive cliches, and offers nothing in the way of interesting lore to the Star Wars universe. Jumbled and hinting at more interesting stories we don't get to hear, each section jars with the previous one. The performance was fine, but the story was written in such a way as to make all the protagonists dialogue stilted and forced with her main companion. It's always odd to hear a narrator imitating the voice of the opposite gender. Most are quite passable, but this was a particularly bad one. Takes me out of the story I guess. Mostly I spent the time wondering why all the characters were so stupid. Protagonist is almost entirely unlikable. Kind of like watching the prequel movies. As a fan of the expanded universe or whatever Disney is calling the books now, I'm disappointed. This book had so much potential but the story was vague in its important story elements, its characters undeveloped and borderline child-like, and was horribly cliche. Didn't sound like it was written by an experienced author. Sharp writing and a great story! What made the experience of listening to Into the Void: Star Wars the most enjoyable? Tim Lebbon's world building and prose. The man can write this stuff! What was one of the most memorable moments of Into the Void: Star Wars? The whole thing was so good that I can't really select one moment. And I really can't say that about too many recent Star Wars novels. Nope. She was pretty good. 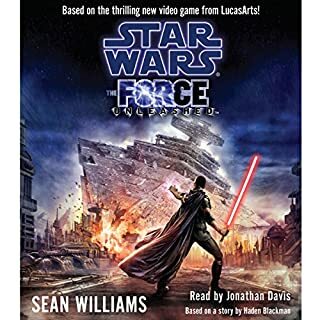 I enjoyed hearing a woman's voice in a Star Wars book with a female protagonist. Marc Thompson is pure awesome and all but this was a nice change. I felt January made it easier to feel like we were inside Lanoree's head. The climax of the novel was very emotional. Lebbon does an outstanding job inter-cutting a flashback of Lanoree's Je'daii training with her brother, Dal, and her pursuit of him 9 years later. It gave the novel a balance and depth that it wouldn't have had had Lebbon simply stuck with the chase and nothing but. It also serves to explain the differences between the modern Jedi and the ancient Je'daii. I recently read the Dawn of the Jedi comics (three trade paperbacks) and was very enthousiastic about them - those stories I would rate five stars. 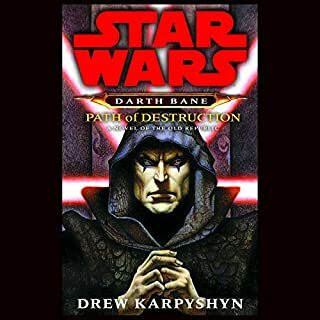 So I was very excited to discover that there had also been written a novel with a storyline from that same - ancient Star Wars - period. However, this story fell short for me. The characters felt very two-dimensional and the supposed heroine was, frankly, rather annoying and unsympathetic. Je'daii (pronounced correctly by the narrator) Ranger Lanoree came across as endlessly hasassing and nagging her brother, not accepting his making a different life choice. Now, this concept in itself I could understand, it is very human to struggle with choices close family members make that we maybe don't get. However, the author did not succeed in writing a gripping story about it, nor did he give his heroine anything remotely resembling an interesting internal monologue; she simply kept repeating how the Force was with her, how much she constantly was aware of it, and, frankly, how awesome it made her. Quite boring. As for the "bad guy" in the novel, Lanoree's brother, the novel does not make clear at all how he reaches his point of Super Villainy. It starts out as him choosing not to have anything to do with the Force, and how he longs to explore the rest of the universe, which seem to me to be quite innocent thoughts. But why this is not acceptable in these Early Days is never explained (would have been interesting! ), nor how this turns him into a full-blown psychopath in the end. Had I cared for this character at all, it would have bugged me. However, I did not care for any of them. I finished the novel because I kept hoping it would get better, but when it finally reached its so-called climax, I felt robbed. In conclusion, if you'd like to find out more about the early Je'daii, skip this novel and get your hands on the comics, for they are truly awesome examples of Star Wars lore, with gorgeous graphic artwork. 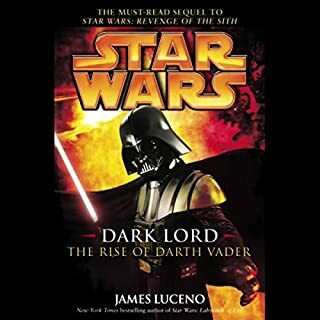 Narration was good however, and I also liked the SW music and sound effects, although it was a bit weird to hear the same sound effects for the Light side of the Force as were used for the Dark Side in Darth Plagueis and Darth Bane. I was originally dubious about January LaVoy narrating this over Marc Thompson (who I love), but she really pulls you into the book as much as Marc does for me. Good choice! Tim Lebbon is talented. January LaVoy is talented. And this is a Star Wars story. So, I'm baffled. 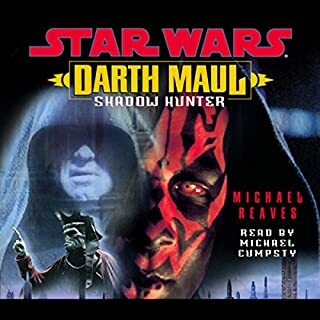 This is the first of dozens of Star Wars audiobooks that I had to convince myself to finish. This should have been a short story. About 1/4 of the way through, the story becomes repetitive. Instead of unexpected twists and turns, it's like attending a football game where both teams go scoreless without a completed pass or passing the 50 yard line after the first quarter. Any true Star Wars fan is fascinated by the dilemmas characters face when seeking a "balance" in the Force. What this novel revealed is that talking about it, describing it, and revisiting it in virtually every chapter can leave you feeling like you've heard the same song thirty times on an 8 hour car trip. It wasn't terrible - but, it's the first SW novel I can say I wont revisit or enthusiastically recommend to others. 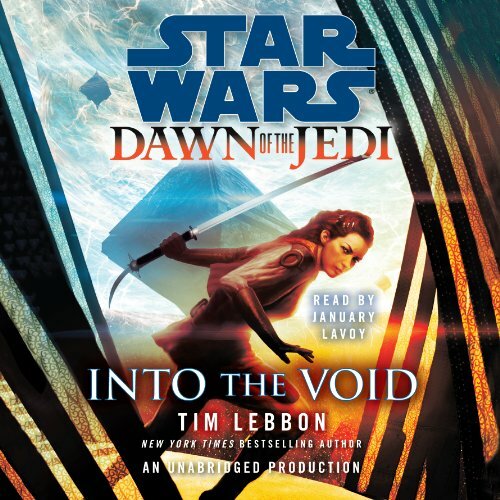 Where does Into the Void: Star Wars: Dawn of the Jedi, Book 2 rank among all the audiobooks you’ve listened to so far? i can't say that i have a favourite character, but they are significantly different to the shall we say modern day Jedi. What does January LaVoy bring to the story that you wouldn’t experience if you had only read the book? January is a new reader for the Star Wars extended universe. it's fitting that she reads a book set in a time when there are none of the usual characters you would expect to see in a star wars story. I would have to compare this story with another story where January reads with well known characters in it. yes but i found it quite hard going at first so i had to spread it over multiple sittings. this story is definitely worth a read. especially when you look at the attitudes to the light and dark sides of the force from then and make coparisons to the republic and beyond era's. most interesting indeed. What did you like most about Into the Void: Star Wars: Dawn of the Jedi, Book 2? I was a bit dubious downloading this as it was book 2 - but as with most of these books you dont miss out too much! I am looking forward to Book 1 being released here but this doesnt detract from this outstanding story! set before pretty much any of the star wars books out there it is a more - human- version of star wars. 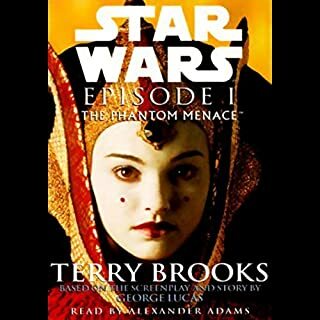 Outstanding story read perfectly by the author with the usual mix of star wars sound effects and musical scores - I highly recommend this! What was one of the most memorable moments of Into the Void: Star Wars: Dawn of the Jedi, Book 2? Listening to the differences in the early jedi philosophies - very different and interesting. Have you listened to any of January LaVoy’s other performances? How does this one compare? First time I have listened to this reader but she was very good! I would like book 1 to be released here but love book 2 as well! So enjoyable in Audible much better than reading the book yourself!! fantastic book realy well read January Labour reads brilliantly! realy got me into this syltory and its heart reanchingly good at times. and you get the Eruption short story on the end. I spent all night and the next day gardening while listening to this! it's such a shame that the books that have inspired these are no longer part of the real star wars canon anymore. 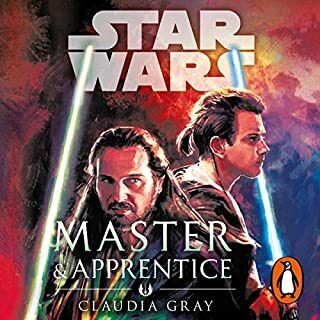 I chose to ignore the fact this isnt cannon its great, wonderful story, unique insight into the ancient jedi. Great listen overall, well narrated and written. great read and a good star wars story. This is anouther great star wars story and a great origin story that's well worth a read. Good story premise. Ancient history in the Star Wars timeline. The sound effects add to the immersion.